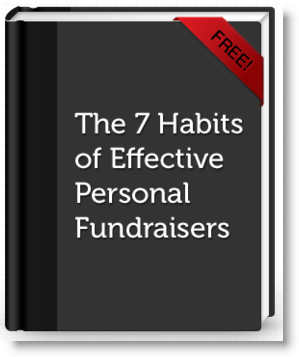 If you’ve been wondering how to harness the power of personal fundraisers - “individual supporters that fundraise for your non-profit or cause,” - you might want to check out the new ebook: 7 Habits of Effective Personal Fundraisers, produced by Causevox. The 7 habits were culled by Causevox “combed through the thousands of individuals that used [their] platform and selected some of the most successful to study. [They] examined what and how much they raised, and identified seven habits that they all had in common.” They also consulted a few experts like Amy Sample Ward, Debra Askanase and Allyson Kapin as well. The most effective online fundraising campaign is a personal one. The most effective fundraisers use their personalities to promote their campaign as well as personal stories. Your relationships with your friends, family and coworkers are compelling enough reasons for your network to give to your cause. Reach out to your personal network of friends, family, and co-workers. A personalized email is the best way to get donations. Social media is helpful to reach new audiences, too. Help other people connect with the cause and need by focusing on being human. Meet people face-to-face to help them understand your passion for and commitment to the cause. Show that even small contributions will amount to big, tangible results. Getting donations for a cause isn’t easy. You’ll have to persevere through some dry spells and be assured that your efforts matter (because they really do!). Update and share progress with friends and family. This is an opportunity to remind others of your fundraising progress and how they can help. Always thank your donors and supporters. They want to be recognized and your appreciation goes a long way. To read the full overview of these 7 Habits, you can download your copy of this free ebook here. Do you have another helpful habit to add? Share the secret to your fundraising success in the comments below.